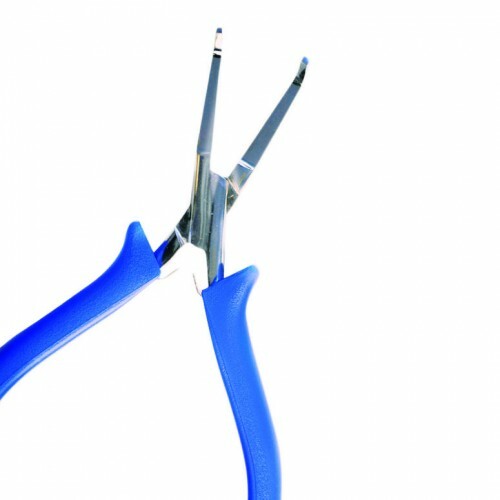 Squeeze the tape-in hair between the flat pliers to get an ultra-flat finish and help fuse the adhesive. The flat pliers for the Tape-In application method is designed to help fuse the tape adhesive to your hair resulting in an ultra-flat finish and longer lasting tape-in hair. Comes with a FREE case. Simply press down on the tape area with the flat plier. Also available is our Tape-In Starter Kit which will give you all the tools you will need to apply hair extensions using this method of application. A super-fast application method, complete a full head of Tape-In hair extensions in 30 minutes! American Dream Tape-In hair application method is ideal for a flat finish and works particularly well with finer hair types. It is also popular with time constrained session stylists who want a clean, easy application. American Dream Tape is ultra-durable and can last 6-8 weeks. Create your section, and then apply the weft onto the natural hair, approximately half a centimetre away from the hairline, avoiding contact with the scalp. To blend, a layer of natural hair is brought back over the extension hair, covering the attachment point. Tape-In hair is great for clients that want quick, semi-permanent extensions.